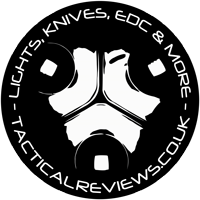 This review of the ArmyTek Predator G2 V2.0 and Predator X V2.0 lights is a classic from 2013, and is part of the Classic Series of reviews to be published on Tactical Reviews. The original versions of the Classic Series Reviews used a well known image host who will be cutting off the visiblity of 3rd party hosted images at the end of 2018. 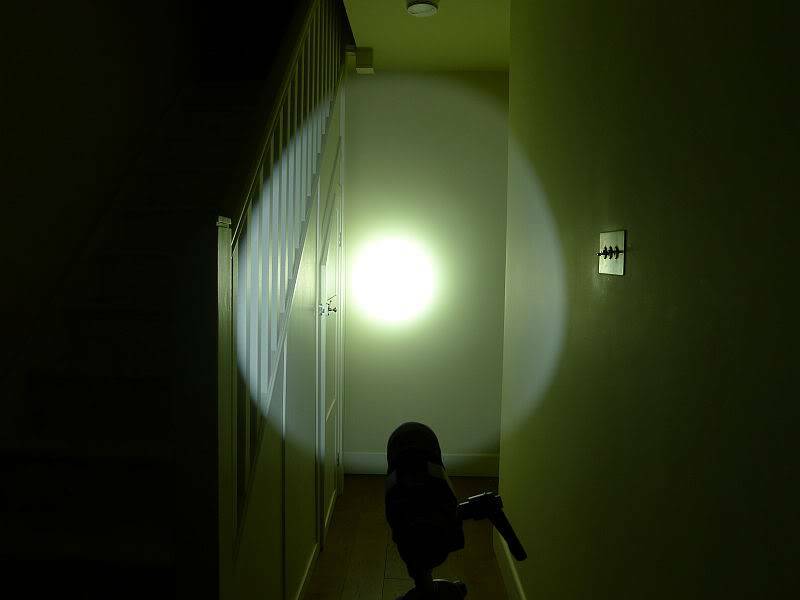 As consumers, and as flashlight enthusiasts, we are spoiled for choice as there many excellent lights on the market. 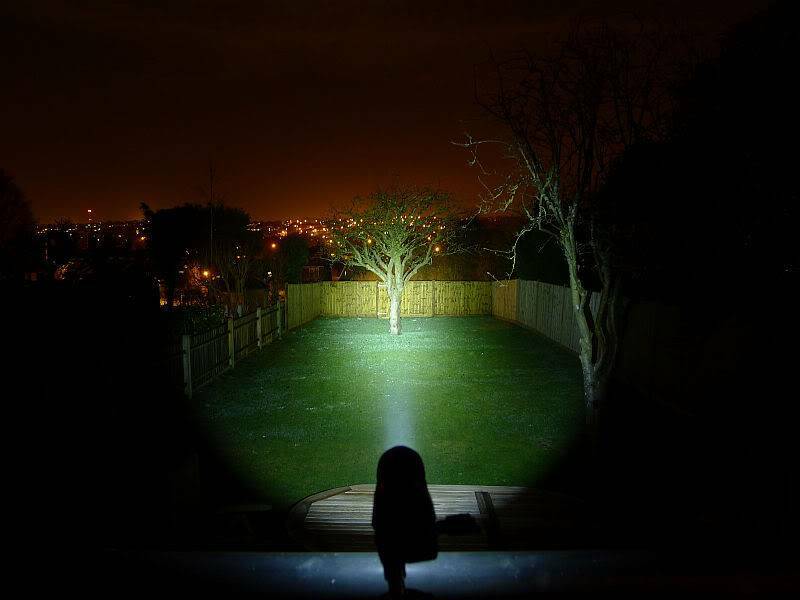 There are a fewer number of outstanding lights, and in my opinion the ArmyTek Predator V2.0 (in whichever version you prefer) is outstanding. 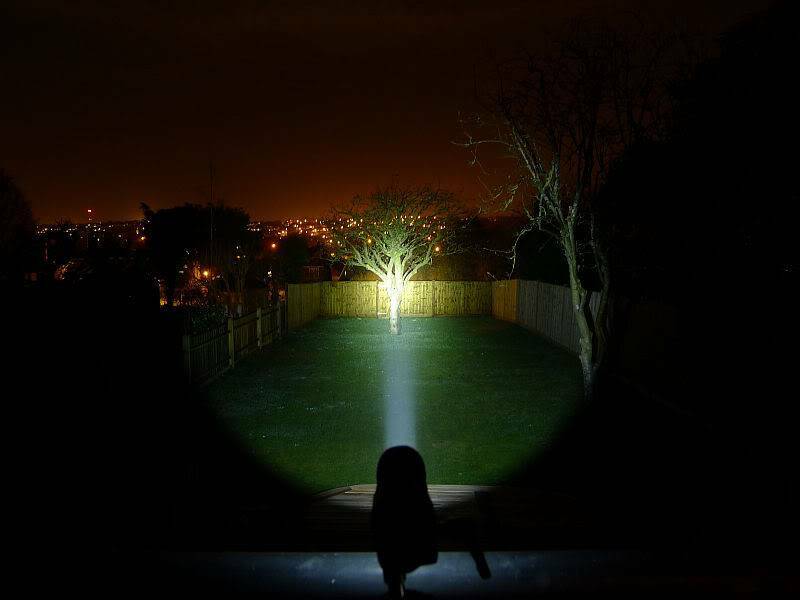 In this review I have two versions of the ArmyTek Predator V2.0 on test, the Predator G2 (fitted with the XP-G2 R5 LED) and the Predator X (fitted with an XM-L U2). 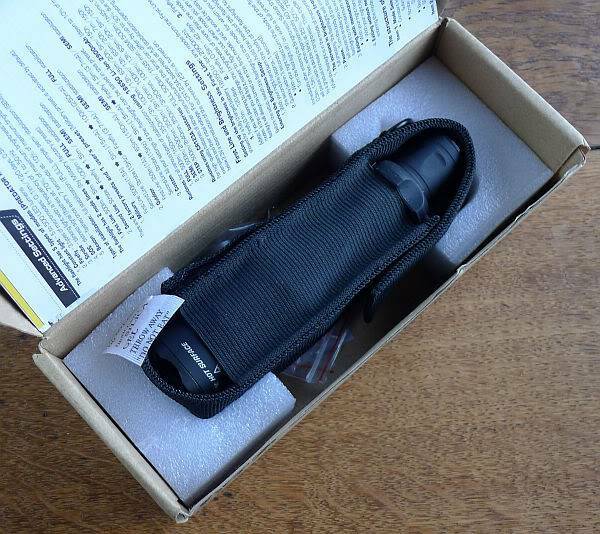 The ArmyTek Predator arrives in simple packaging that belies its incredible versatility. 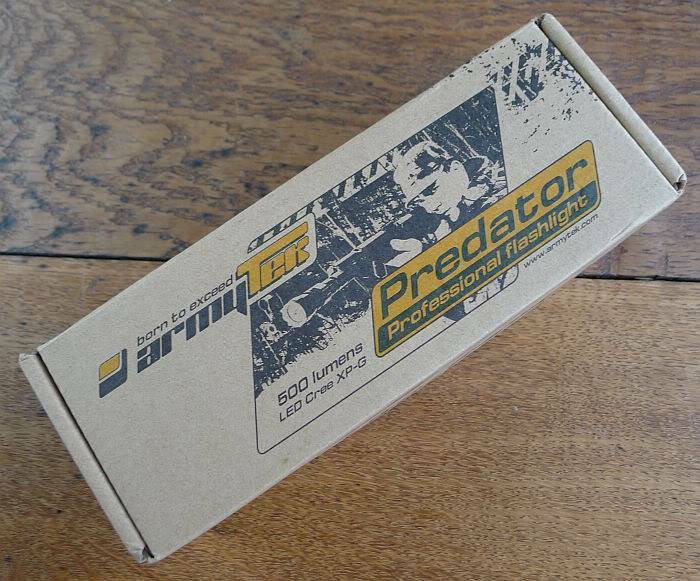 The V2.0 still sports the matt anodised surface of the original Predator. 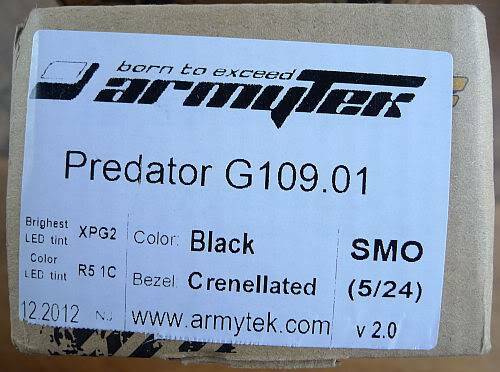 This feels different to standard smooth anodising and gives the Predator a covert appearance. The finish seems to make the Predator feel less cold to touch and has good grip. 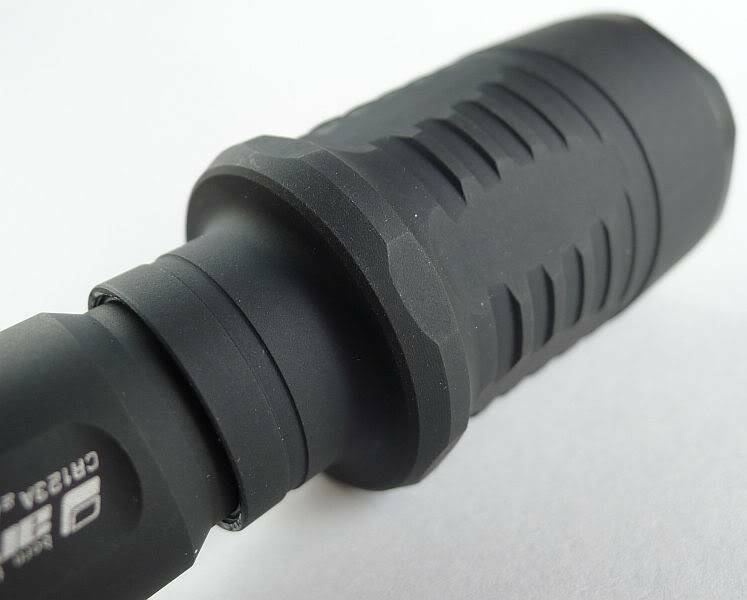 Compared to the Predator V1.2, the V2.0 has a new removable silicon rubber tactical grip ring, updated removable pocket clip, slightly larger diameter head/reflector (about 5mm bigger), is slightly shorter overall (about 6mm shorter) and has an updated selection of emitters. Initially slightly dubious about a rubber grip ring, this is very comfortable and secure to hold. 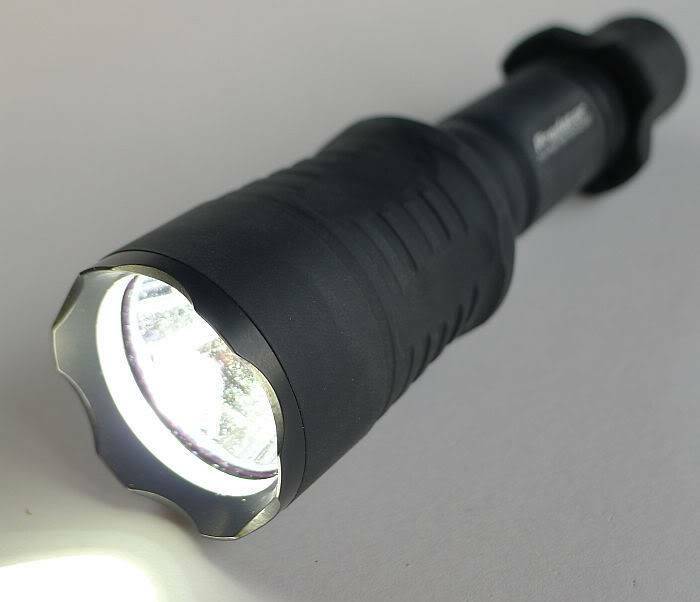 In designing the Predator, ArmyTek have managed to make what appears to be an incredibly robust and a truly military-grade light. And the XM-L U2 (1C tint) Smooth Reflector with 8º hotspot and 55º spill. Both arrived in identical boxes (just the labels shown above on the end of the box being different). And both look the same inside. This is the Predator X with XM-L U2. 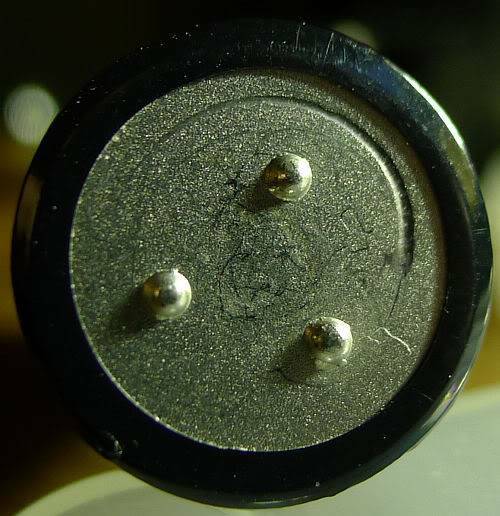 The side of the battery tube has two flat areas with the logo and model. The Predator V2.0 now has a removable silicon rubber tactical grip ring which has a hole for fixing a lanyard through. 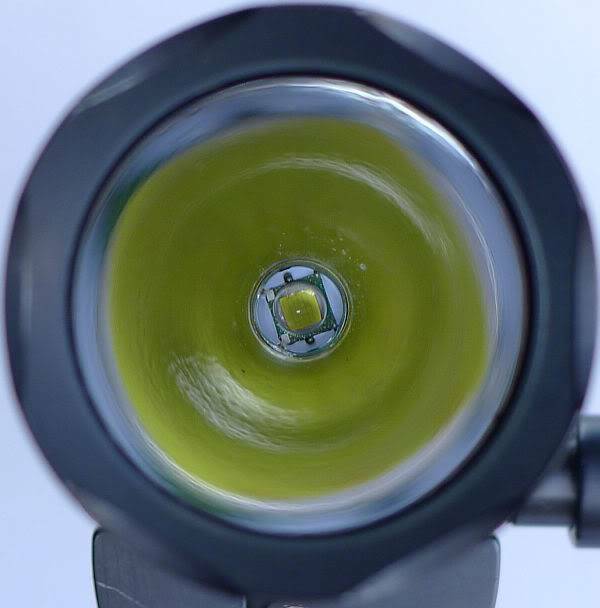 The head of the light has anti-roll flats (which combined with the grip ring keep it stable on a flat surface). 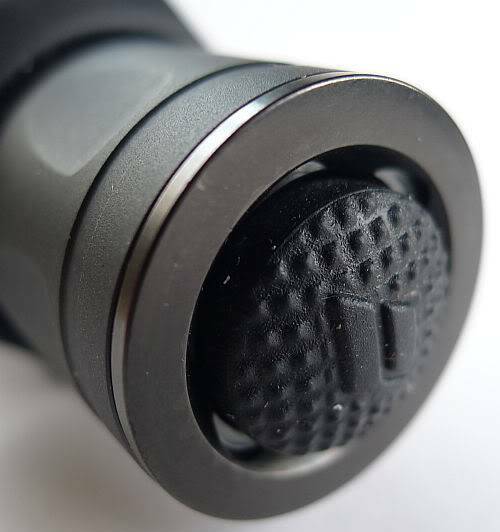 Another change from the earlier version is the tail-cap switch, which no longer sports crenulations, making the button easier to press and reducing the length of the tail-cap. The switch boot retaining ring looks like it will be a bit more challenging to remove though, now that it is smooth. The positive contact is a raised metal pad. 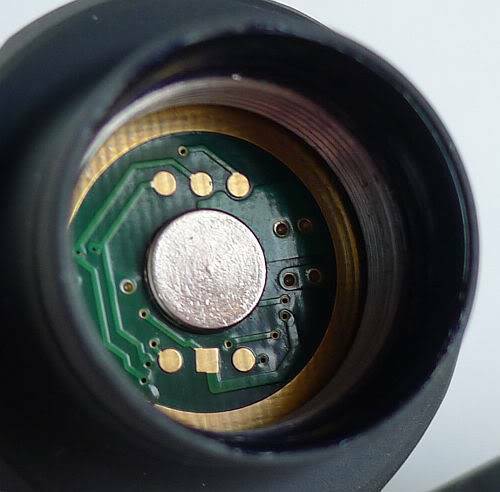 The battery tube ring-shaped contact is slightly raised, but has texture that makes it look like a raised part of the PCB rather than a metal contact ring, so this may not be as robust as the positive contact. 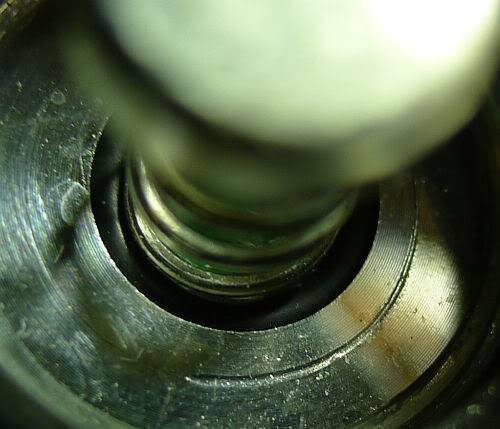 At the head end of the battery tube, the threads are bare. Two o-rings are used to seal the battery tube. The threads are standard and cleanly cut. As supplied they are well lubricated. 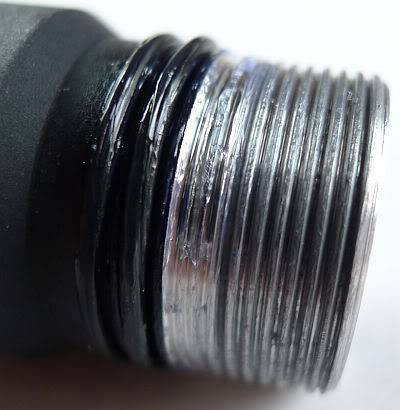 At the tail-cap end there are also two o-rings and the threads are anodised. Again as supplied they are well lubricated. 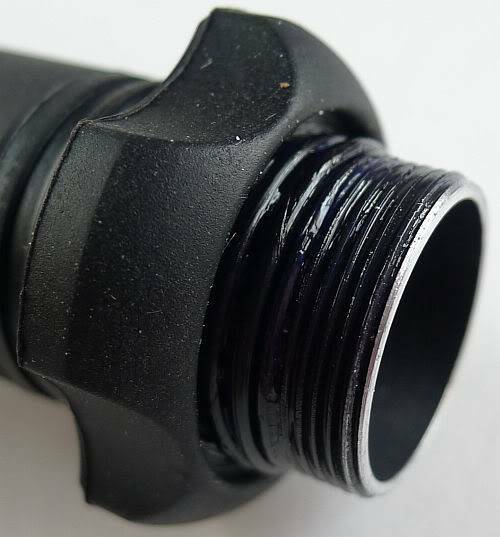 The negative terminal in the tailcap is a strong spring with a metal cap to increase surface contact area and stabilise the end of the spring. First LED is the Predator X’s XM-L U2. Looking a little closer the G2’s surface is more even than the XP-G with a lack of visible conductor strips. The Predator’s user interface has two inputs. The first is the forward-clicky tail switch, and the second is the head being tightened or loosened. 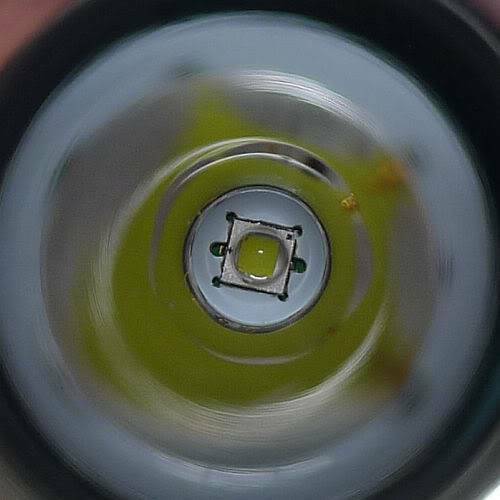 With the head tightened you are using what ArmyTek refer to as Line 1 modes. With the head loose, you are using the Line2 modes. Each ‘Line’ can have multiple output modes. By default Line 1 has three constant output levels (equivalent to say Max, Medium and Low), and Line 2 has one flashing and one constant (strobe and brighter of three ‘firefly’ modes). To change mode within the ‘Line’ you are using, either loosen then tighten (or tighten then loosen if using Line 2) quickly to move to the next output mode in that ‘Line’. As supplied, you can just start to use the Predator like this, and you don’t HAVE to do any programming to customise it……..but you can, so why not. Reset to factory defaults or use custom presets. Also included is a battery voltage check feature which will indicate the battery voltage with a set of flashes. Setting up the Line 1 modes output levels. Using the main Setup menu to configure the majority of options. 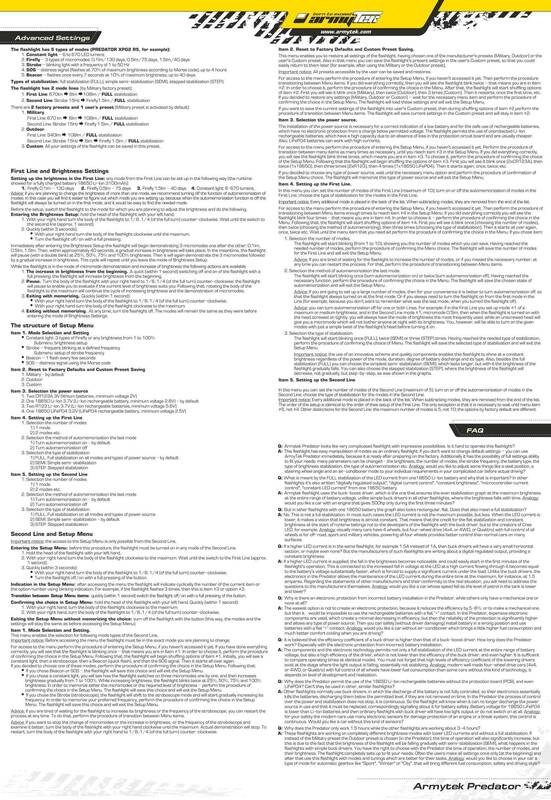 You will still need to consult the ArmyTek instructions for the detail and planning what you want to set up, but hopefully this condensed guide will help you actually carry out the programming. So with all of this choice, the biggest problem is deciding how you want to customise it. 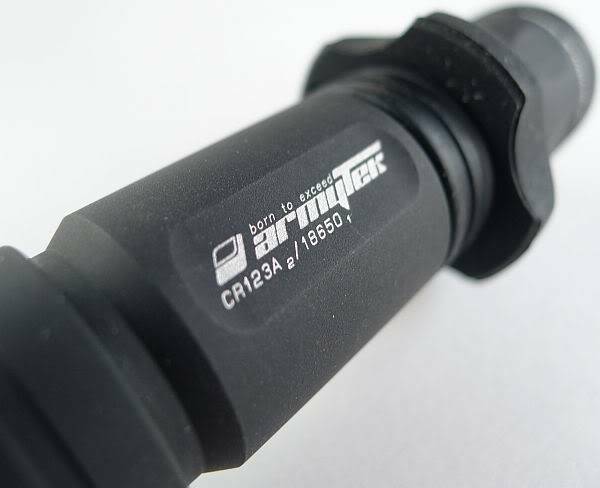 The Predator can run on2xCR123 or 2xRCR123 or 1x 18650 Li-ion or 1×18650 LiFePO4. Although you can get away without bothering to change the power source in the menu, doing so optimises the Predator to work with the chosen power source (effectively changing the lower cut off voltage and therefore the low battery warning voltage). This allows you to safely use unprotected Li-ions as the Predator itself will prevent damage to the cell once the low voltage limit has been reached. When set to 2xCR123 the Predator will run them down to 2V allowing you to get the most out of them. 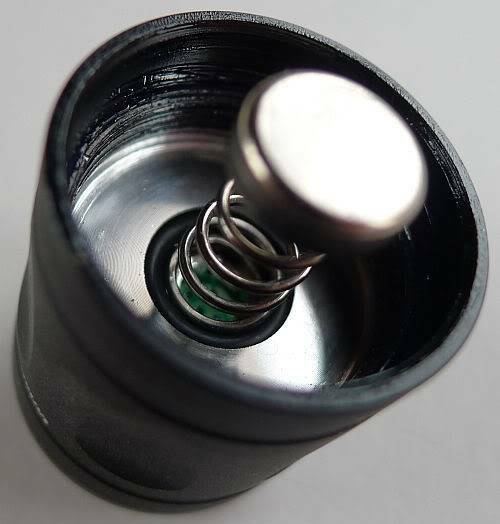 Due to the terminal design, the Predator can use button or flat top cells. 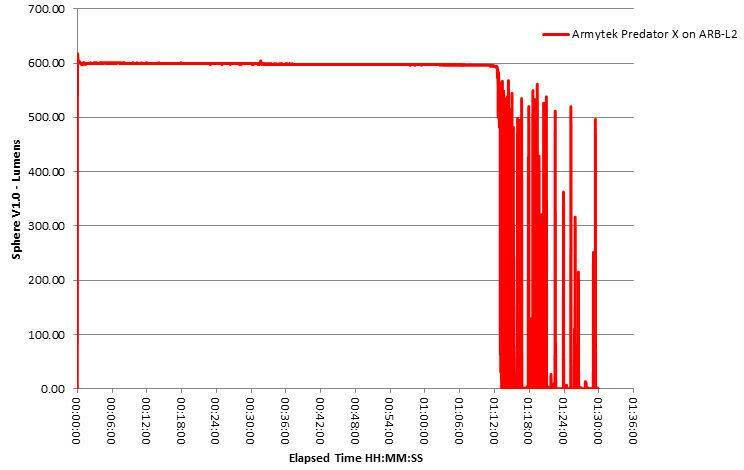 However I did come across one issue when trying to use AW’s 3100mAh cells. AW’s 3100mAh cells have three raised dots on the negative terminal. 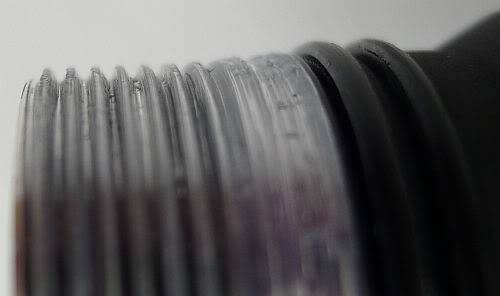 When screwing the tail-cap on, the metal cap on the Predator’s negative terminal spring, catches on these dots and gets dragged sideways. As you can see here, the battery terminal has a groove scored into it when this happened. Inside the tail-cap there is similar damage where the negative terminal cap dug in. 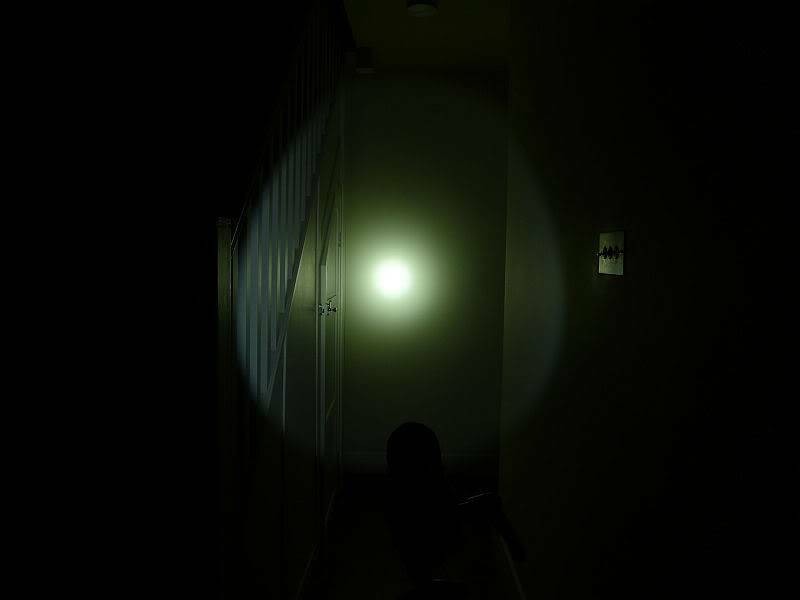 When this happened the tail-cap switch was bypassed and the light came on without the switch being pressed. This only happened due to the raised dots. The AWs are the only cells I have with this design feature, but unfortunately it means you cannot use them with the Predator. 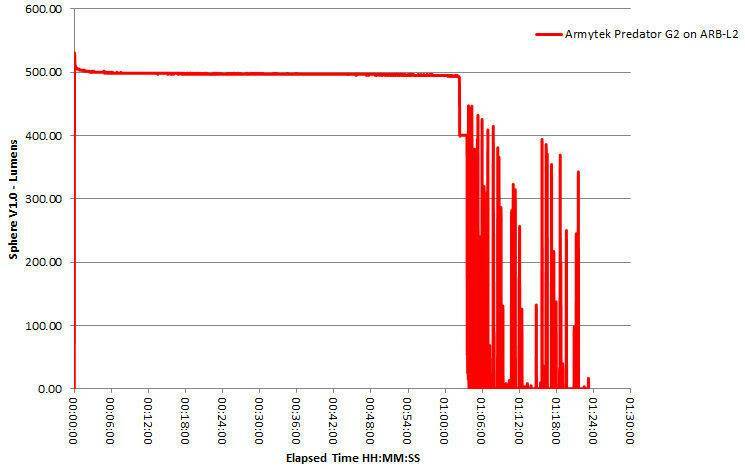 Due to this, all testing was carried out with Fenix ARB-L2 18650 cells and CR123 primary cells. All output modes are free of any sign of PWM. As mentioned previously the Predator uses three different types of output stabilisation (see the instructions for more details), including FULL stabilisation which maintains the specified output level without dropping at all until the battery can no longer maintain that output. The default configuration is for the Line 1 modes to be run as FULL stabilisation, so this is how I tested the maximum output runtime test. First up is the G2. At the end of the runtime, the trace becomes noisy – at this point the Predator started to flash to indicate the battery was low. The low battery flash continued for over half an hour giving you light you could find your way about with. Switching off and on in Line 1 resulted in no output. Changing to Line 2 while off did allow further use on firefly modes. Next is the Predator X. Again at the end of the runtime, the trace becomes noisy – at this point the Predator started to flash to indicate the battery was low. The low battery flash continued for over half an hour giving you light you could find your way about with. Switching off and on in Line 1 resulted in no output. Changing to Line 2 while off did allow further use on firefly modes. Another aspect of the Predator’s output that must not be looked over are the excellent ‘firefly’ modes. At a specified 0.1lm, 0.5lm and 1.5lm these are too low for my integrating sphere to measure. 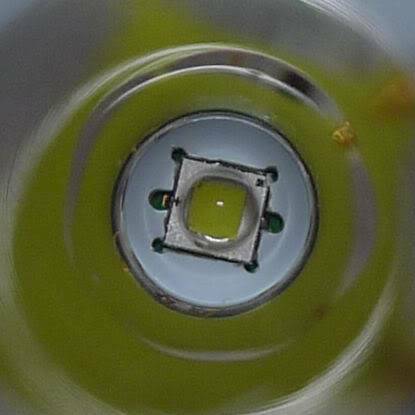 Bearing in mind that ArmyTek have specified their outputs as at the LED, the real output of these firefly modes is probably even less. 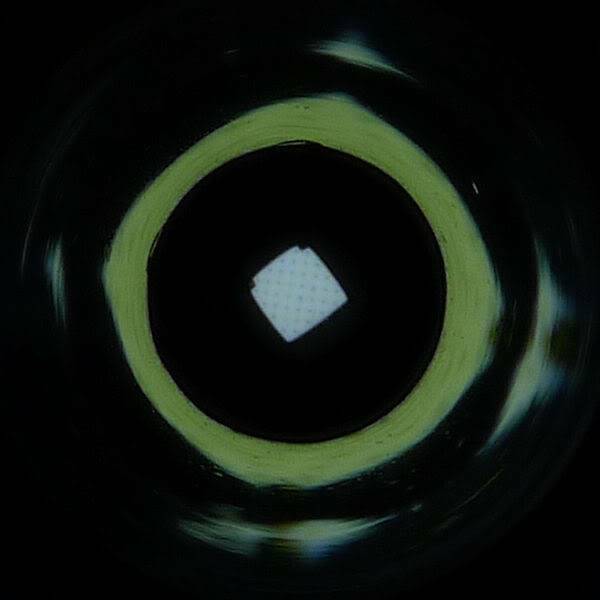 On the lowest mode, looking straight into the G2 shows the emitter’s surface structure. 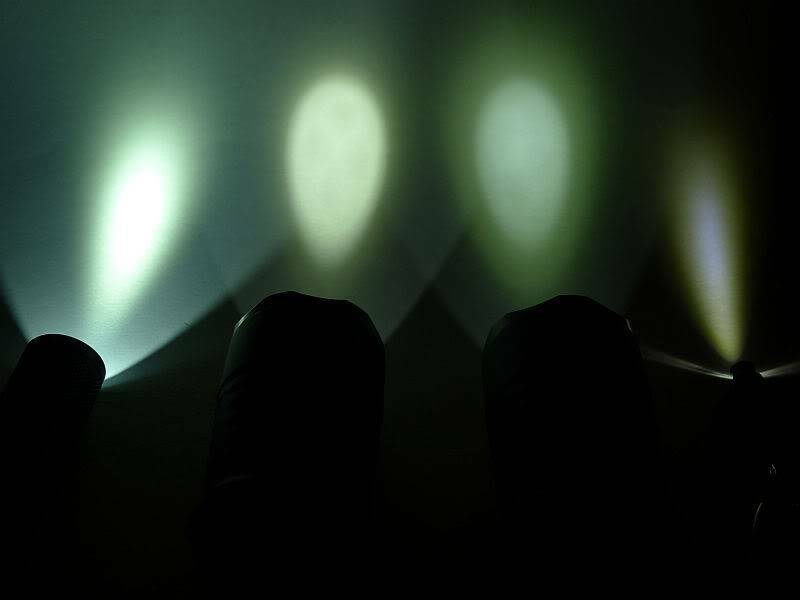 As I can’t measure these low outputs, here are the two Predators next to two other well known low output lights. Far left is the Quark AA on moon mode, then the Predator G2, Predator X and the Photon Freedom Micro all on their lowest modes. 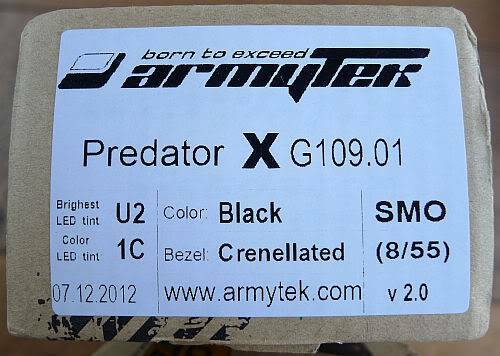 Interestingly the Predator X’s lowest output appears to be about half that of the G2 version. Both are significantly lower than the Quark Moon mode and the Predator X is not far off the Photon Freedom Micro which is one of the lowest outputs out there (but the Photon achieves this with a terrible PWM whereas the Predator’s output has no PWM). 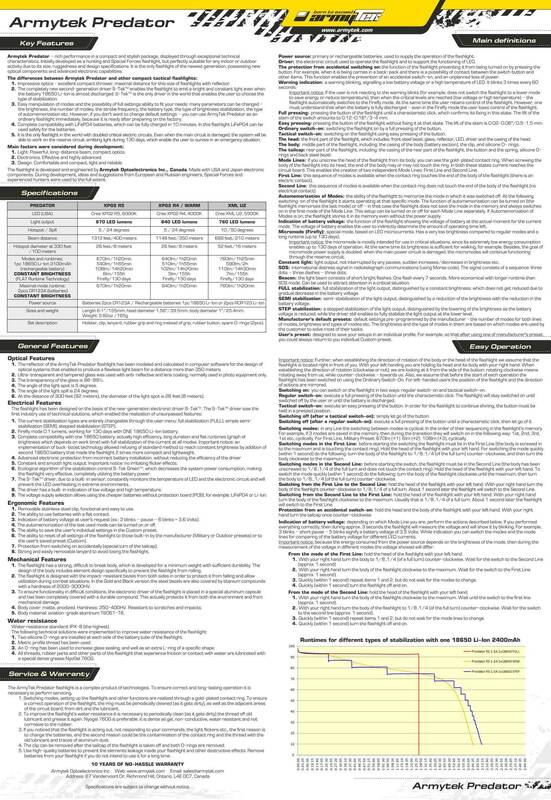 NEW for Winter 2012 ANSI standards include maximum beam range. 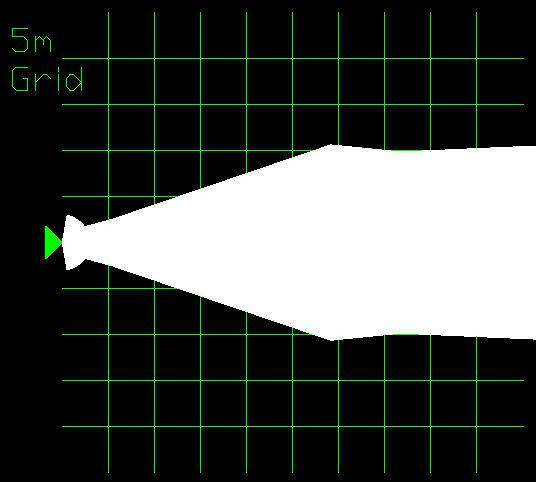 This is the distance at which the intensity of light from an emitter falls to 0.25lux (roughly the same as the lux from a full moon). 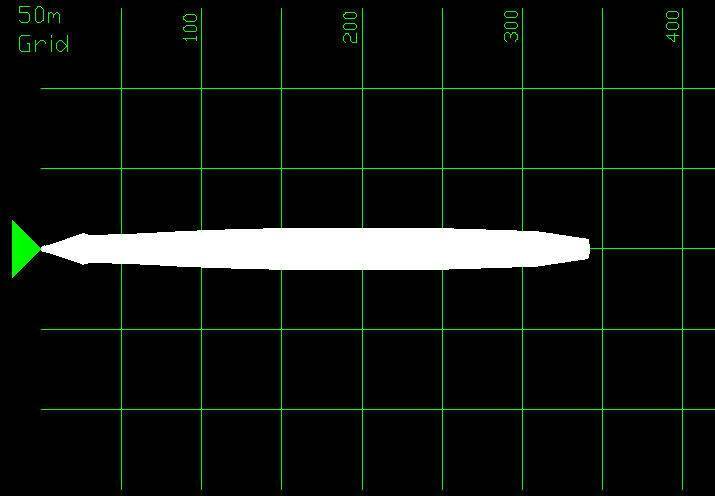 This standard refers only to the peak beam range (a one dimensional quantity), so I am expanding on this and applying the same methodology across the entire width of the beam. 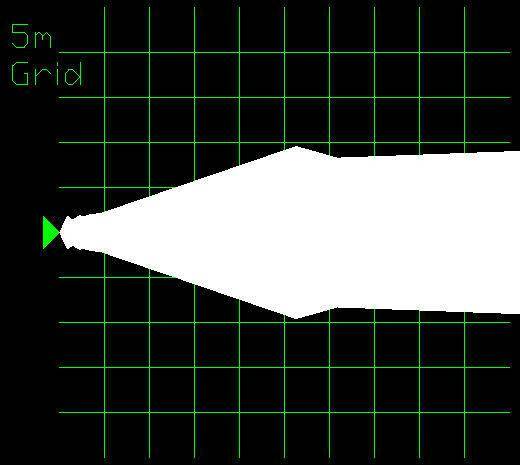 From this data it is possible to plot a two-dimensional ‘beam range profile’ diagram which represents the shape of the illuminated area. 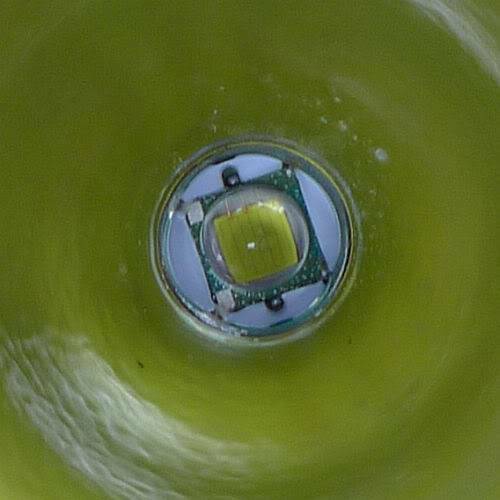 In order to accurately capture this information a test rig was constructed which allows a lux meter to be positioned 1m from the lens and a series of readings to be taken at various angles out from the centre line of the beam. 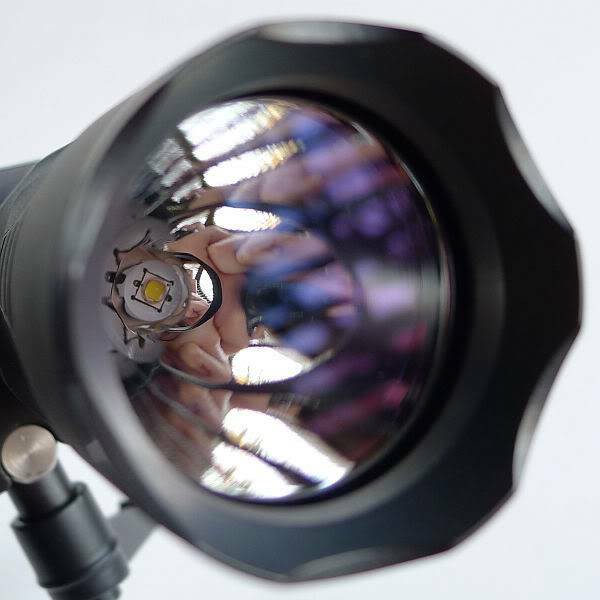 As the rig defines a quadrant of a circle with a radius of 1m, all the readings are taken 1m from the lens, so measuring the true spherical light intensity. The rig was designed to minimise its influence on the readings with baffles added to shield the lux meter from possible reflections off the support members. The distance of 1m was chosen as at this distance 1lux = 1 candela and the maximum beam range is then calculated as the SQRT(Candela/0.25) for each angle of emission. In this plot, the calculated ANSI beam ranges are plotted as if viewed from above (for some lights there may also be a side view produced) using a CAD package to give the precise ‘shape’ of the beam. 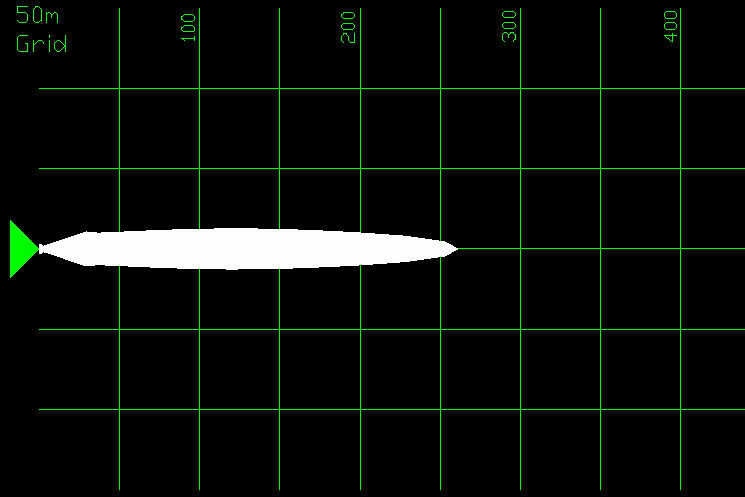 Starting with the 5m range grid, the G2’s beam profile. And the Predator X’s on the 5m range grid. 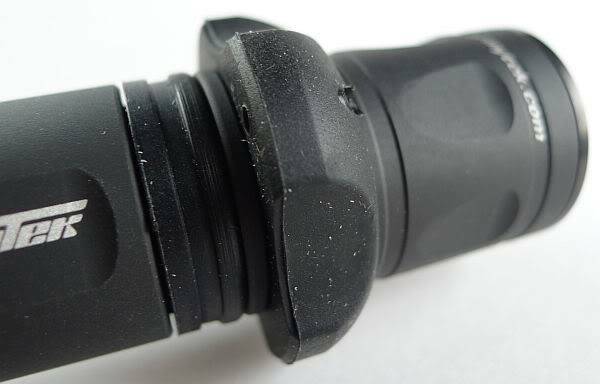 Although the spill of the G2 is specified as 5º hotspot and 24º spill and the Predator X with 8º hotspot and 55º spill, although the Predator X does have a stronger spill, the difference is not as obvious as it is in the beamshots. However zooming out to the 50m grid shows a bigger difference with the G2 being a strong thrower. And the Predator X having a generally wider beam up to 150m (with the broader spill using up the extra output of the Predator X). The outdoor beam shot confirms how good the throw of the Predator G2 is. 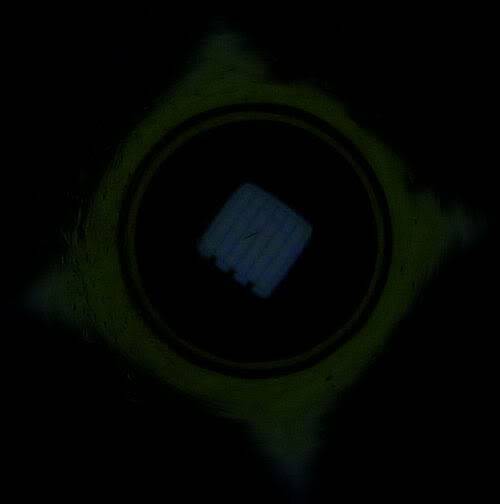 The Predator X’s beam has a much brighter spill and much wider hotspot. The older Predator V1.2’s tail switch was always a bit stiff to operate. It is nice to see that ArmyTek have addressed this with the new Predator V2.0 as the switch requires much less force to operate. The holster supplied is designed for bezel down carry, and is a ‘gentle fit’ as the elasticated side panels hold the Predator gently while allowing very easy insertion and removal. The Predator G2 is one of the best throwers I have used, not in absolute range, but in the fantastic beam quality and a very good range. At longer distances where the spill fades away, the Predator G2 projects a perfect disc of light, like a spotlight, allowing you to scan areas a long way away. 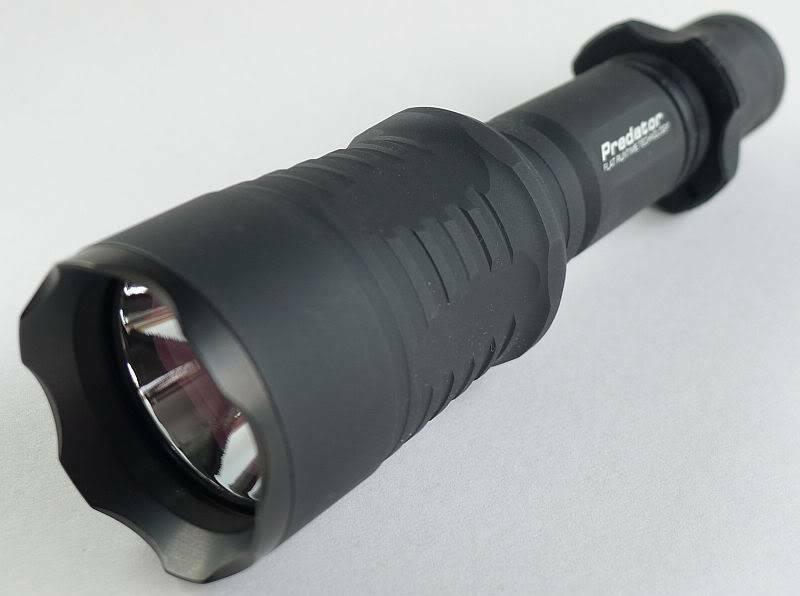 The Predator X provides a more even spread of light so has a smaller overall range but lights up a wider area. This is better for closer and indoor use than the G2. Both beam profiles are excellent, and it is difficult to pick a favourite as the G2 has better throw, but the X has the lower firefly output and higher maximum output. I sense a CPF resolution to the problem of deciding – simply get both. The new tactical grip ring feels really comfortable, much more so than metal grip rings, and with my XL hands (well that is my glove size) the Predator is a good fit in my hand. The softer touch tail switch with forward clicky action makes for easy, silent momentary use, and coupled with the ultra-low output levels is perfect for night time forays. I’ve kept the default full stabilisation on Line 1 as the totally consistent output regardless of the state of the battery is excellent. The low battery warning means you are not plunged into darkness even when using full stabilisation, and as the two ‘Lines’ can be set with different stabilisation modes you could easily program the same output levels in each ‘Line’ but with different stabilisation – one for times when maximum performance is needed and one for when extended runtime is preferred. 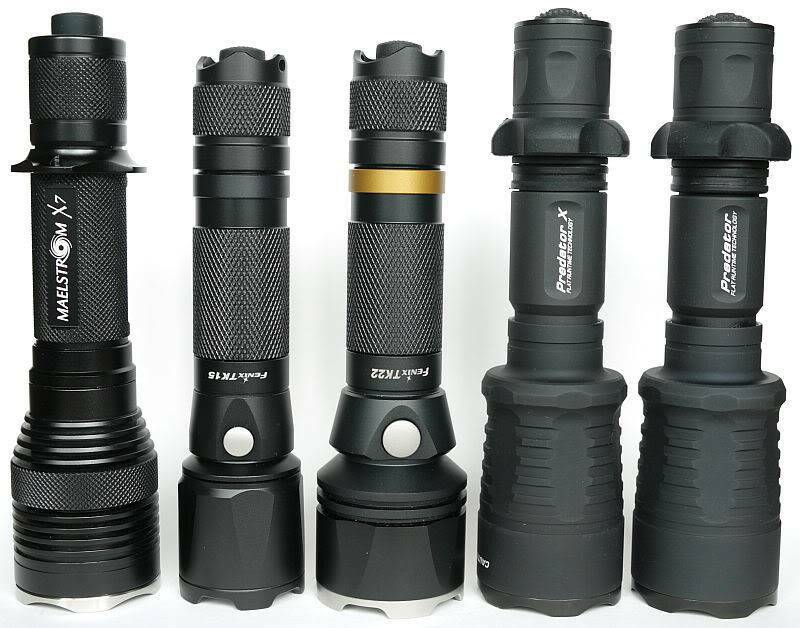 For an idea of the size of the Predator V2.0 compared to other 1×18650/2xCR123 lights, here they are shown with (from the left to right) the FOURSEVENS Maelstrom X7, Fenix TK15 and Fenix TK22. 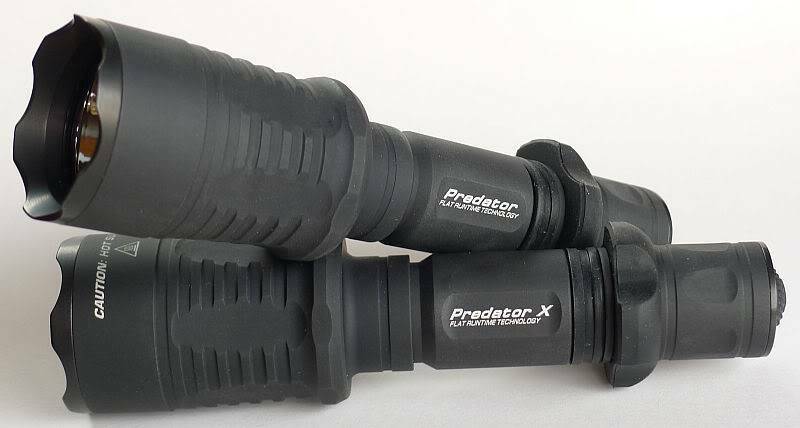 It is the size of the excellent quality reflector that makes the Predator slightly longer and it is this reflector that gives the Predator such a great beam. I still feel slightly restless about whether I have the Predator G2 and X set up just as I want them. With so many options it makes you wonder. But of course the joy is that you can change the configuration any time you like. 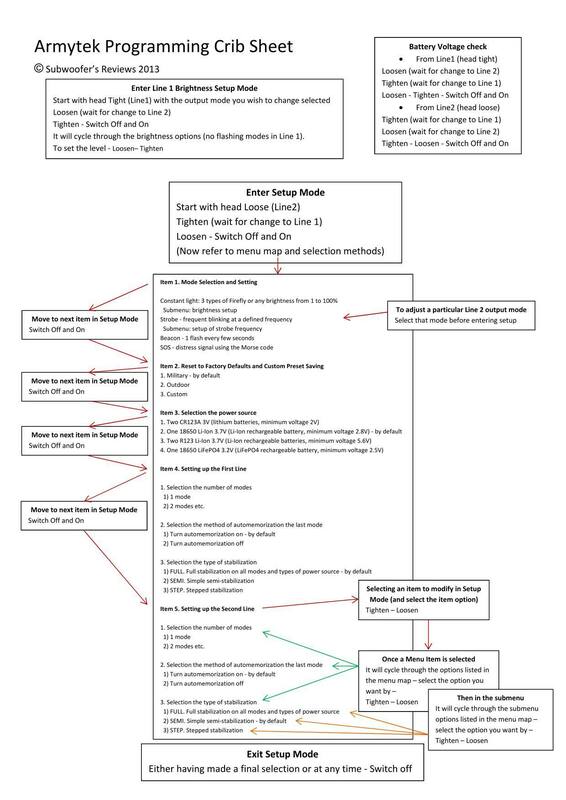 The only slight issue being that you need to plan this as you really need the instructions in front of you for reference if you are going to make a change (it is not something I would do out in the field). 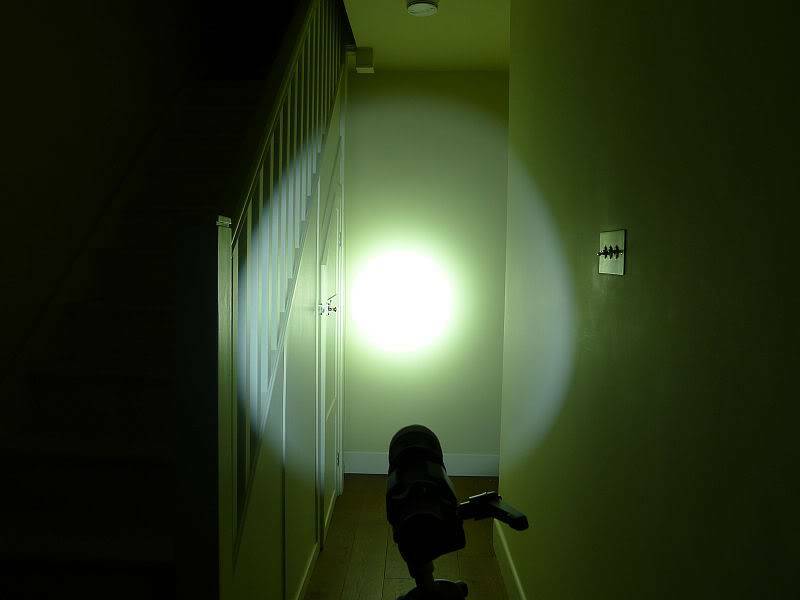 The build quality, beam quality and extensive features and customisation options really do make this an outstanding light, and genuinely one of my all-time favourites. 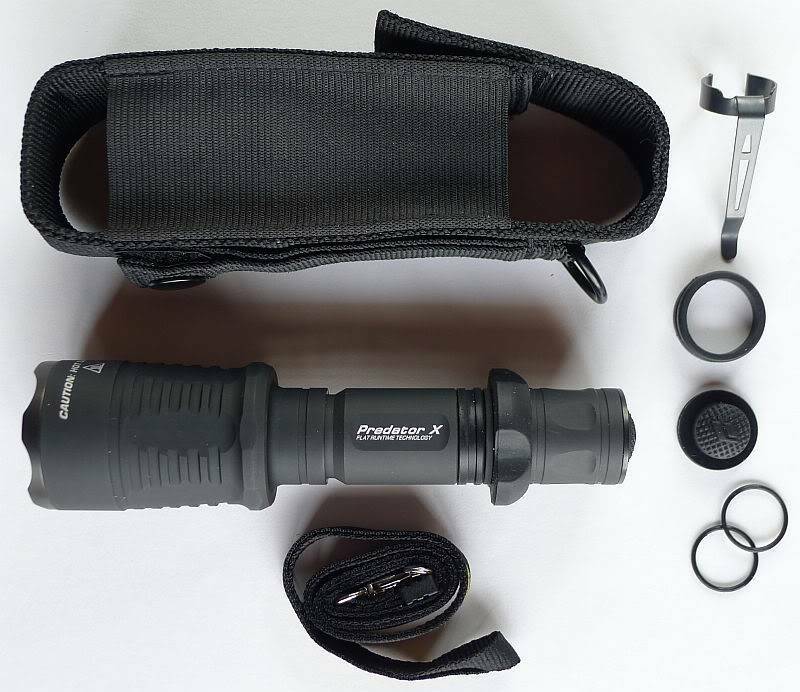 The Predator is a light you’ll make up any excuse to use it ‘just for the sake of using it’, well I do. Test samples provided by ArmyTek for review.